Scientific literacy is usually thought of as knowing what atoms and molecules are, and that the Earth is spherical and orbits around the Sun, and that we stick to Earth and the Moon sticks to Earth and the Earth sticks to the Sun because of the force of gravity, and that the Earth came into being about 4 or 5 billion years ago, and that the whole Universe came into being about 13 to 15 billion years ago, and that all living things are related to one another and descended from common ancestors; and so on and so forth. Scientific literacy is equated with knowing scientific facts and theories, in other words. All those things can be very interesting, but they are largely irrelevant to the role that science plays in society. That role, however, is something that every citizen ought to understand, and most particularly those citizens who are in policy-influencing or policy-making positions. Scientific literacy ought to mean understanding what role science can properly play in the wider society. —>> Science is produced by scientists. Therefore it is influenced by how scientists behave. Scientists are human beings: fallible, subject to conflicts of interest, and influenced or even constrained by their social and political environment. Science can therefore be reliable or unreliable, depending on circumstances. Textbook examples of unreliable science are Lysenkoist biology in the Soviet Union and Deutsche Physik (Aryan, non-Jewish physics) in Nazi Germany. But conflicts of interest, dishonesty, systemic corruption (for example) can make science — what scientists produce — unreliable even in open, free, democratic societies. —>> Science isn’t done by the so-called scientific method. Many schools and many college-level courses in social science teach that science proceeds by posing hypotheses, testing them, and then rejecting them or keeping them as established theory. That “scientific method” seems like an entirely impersonal formula, capable of producing objective results; but even on its own terms, it takes little thought to realize that judgment needs to be exercised as to whether or not any given results do or do not support the hypothesis being tested. Preconceptions, conflicts of interest, and other quite personal matters enter into the forming of judgments. The chief trouble, though, is that almost no science is done that way. Very few scientists ever do anything like that; for an extended illustration and examples, see my Scientific Literacy and the Myth of the Scientific Method (University of Illinois Press 1992). In a few areas of physics, or in planning protocols for experiments requiring statistical analysis, something like that “scientific method” is used, but not in most of science. If science in general were done that way, then every budding scientist would be taught that “scientific method”. They are not. I had acquired a chemistry Ph.D. before I had even heard of that scientific method — which I did from a political scientist. —>> However, most people do believe that science is done by the scientific method. Since that procedure sounds so objective, impersonal, and reliable a way of attaining knowledge, most people generally assume “science” to be trustworthy, not significantly different from true. Scientists enjoy high prestige and their pronouncements are accorded the trustworthiness that “science” enjoys. —>> Science became regarded as trustworthy because of its perceived successes. It superseded religious authority with the triumph of Darwinism over Biblical creation: Darwin’s disciple, T. H. Huxley, preached sermons explicitly on behalf of The Church Scientific. By the end of the 19th century, science had become the touchstone of authentic knowledge (David Knight, The Age of Science: The Scientific World-View in the Nineteenth Century, Basil Blackwell, 1986). To get a sense of just how powerfully persuasive scientific conclusions are nowadays, contemplate the different rhetorical impacts of “tests have shown” and “scientific tests have shown”; you might harbor doubts as to the first but surely not about the second. —>> Science does not and cannot deal in truth. Science can describe how things are and how they behave. Why they do so is not observable, so any explanations are inferences, not facts. The misguided view that the scientific method delivers objective impersonal reliable knowledge obscures that. The fact that any given theory can yield calculations that fit with what actually happens doesn’t mean that the theory is true or that the things it uses are what really exists. We can calculate planetary motions with exquisite accuracy using gravity theory, even as we nowadays don’t believe that gravity really exists, curvatures of space-time produce the illusion of gravity. We can calculate many things very accurately about electrons and atoms and molecules with the “wave-function” equations of quantum mechanics, but one can hardly believe that wave functions are real things, or that the “wavicles” we call photons, electrons , protons, etc., are actual things that have the properties sometimes of waves but sometimes of particles. No matter how useful a theory has been in the past, it cannot be guaranteed useful in the future. The data we accumulate by observation cannot guarantee that future data might not seem contradictory; the fact that all Europe-observed swans had been white did not mean that all swans are white, as explorers of Western Australia discovered. The misguided belief that science represents truth, which amounts to a religious-like faith in science, is called scientism. —>> Science is popularly thought to progress steadily. In reality, the history of science is one of trials and errors, periodic advances but also periodic discarding of earlier notions found later to be wanting. Many people have heard of Thomas Kuhn’s description of scientific progress through scientific revolutions, which is readily interpreted as perpetual advance in step-wise fashion, revolutions as milestones of progress. What is not widely understood is that the revolutions — overturning of earlier views — are thereby also gravestones of a previous mainstream consensus. Nor is any given scientific revolution necessarily permanent. Belief that light consists of particles or that it consists of waves alternated over the centuries, up to the latest view that it is something else, in a sense both or neither. That latest view may not be the last word. —>> Science as methodical and objective became readily confused with the even more misguided view that scientists behave methodically and objectively. Surveys have indicated that scientists are widely regarded as smarter, more intellectual, more capable of cold objectivity than non-scientists. First-hand acquaintance with scientists effectively disabuses one of such an opinion: religious views, conflicts of interest, cognitive dissonance (inability to recognize contradictory evidence) affect scientists as much as anyone else. —>> Science and thereby scientists are commonly thought to be always on the lookout for new discoveries, the more striking the better. The history of science, however, reveals that the most remarkable advances have almost always been strongly resisted when they were first claimed. The classic descriptions of this phenomenon are Bernard Barber, “Resistance by scientists to scientific discovery” (Science, 134  596-602) and Gunther Stent, “Prematurity and uniqueness in scientific discovery” (Scientific American, December 1972, 84-93); more recent commentaries are in Ernest B. Hook (ed)., Prematurity in Scientific Discovery: On Resistance and Neglect (University of California Press, 2002). Extensions of mainstream views, discoveries that do not require any modification of established theories, are surely welcomed; but the breakthroughs, the revolutionary claims, are almost always resisted or ignored, and become appreciated only by hindsight. None of those points are controversial among those whose special interest is the nature of science, its history, and its role in society. But those specialists are a small and somewhat obscure breed, even within academe, and their specialty, STS, is still not widely known — see the ABOUT page of this blog. A salient problem with contemporary national and international science policies is that the policy makers and the media and the general public have not yet learned that it is scholars of STS who should be consulted regarding science policy and controversies about scientific issues. Current practice is to take the advice of the experts in the technical disciplines, the scientists and the physicians and the engineers. But this amounts to believing the contemporary mainstream consensus to be unquestionably true, and history has shown that this is not warranted, the consensus might even be fatally flawed. The understanding that STS offers should mediate between the experts and the policy makers. As war is too important to be left to the decisions of the generals, so nowadays science and medicine are far too important to be left to the decisions of the scientists and the doctors. A politically liberal global-warming skeptic? There is no doubt that human-caused production of carbon dioxide is adding appreciably to the rate at which the Earth is warming. That’s settled science. At least so it’s said by commentators on MSNBC, on PBS, and in most of the other media. There is no proof that carbon dioxide is causing global warming. At least that’s been said by prominent Republican candidates for President of the United States, and by commentators on Fox News and other conservative media. It is politically incorrect for people on the political left to doubt human-caused global warming. It is politically incorrect for people on the political right to accept human-caused global warming. In other words, beliefs over a matter of supposed scientific fact are determined by political ideology. This is absurd, yet the absurdity is being largely ignored in public discourse. This state of affairs comes about in some part because science is thought to be too technical for the general public to understand. So the matter is left to be settled by science itself. But what is science itself? The conventional wisdom equates it with the position taken publicly by scientific organizations and their representatives — what’s often called the mainstream consensus. Could the mainstream consensus — “science itself” — ever be wrong? Historians of science would find it hard to take that question seriously. They know that in one sense the mainstream consensus has always been wrong, at least in the long run. To varying degrees, of course; sometimes only a little wrong, but also sometimes entirely wrong. Science has progressed because the mainstream consensus at any given time was never the last word. Around the beginning of the 20th century, quite a number of mainstream beliefs turned out to have been completely off the mark: unstable atoms, radioactivity, particles as waves and vice versa, energy existing as bundles and not in arbitrary amounts . . . .
Is all that water under the bridge? Is science now on the right path everywhere? Has the mainstream consensus somehow become the last word now? Believe that at your peril. As the saying goes, those who do not remember history are doomed to repeat it. But who remembers the history of science? Only a few historians and specialists in science & technology studies (STS), a relatively new field that seeks to integrate history of science, philosophy of science, sociology of science and other pertinent disciplines. Concerning the possibility that a present-day scientific consensus could be wrong, the conventional wisdom, the media, the contemporary scientific authorities all seem to be ignorant of history. So we keep repeating that history of dismissing and deriding minority opinions, some of which later turn out to have been more correct than the mainstream. For one instance, Drs. Barry Marshall and Robin Warren discovered the ulcer-causing bacteria, Helicobacter pylori, in 1982, but they were ignored, dismissed, derided by the mainstream consensus for a decade or two, because everyone knew that ulcers were caused by stomach acid and emotional stress; still, in 2005 Marshall and Warren received a Nobel Prize for their discovery. For another instance, recall that Carleton Gajdusek received a Nobel Prize in 1976 for discovering that kuru-type brain diseases (akin to mad-cow disease) were caused by a “slow virus”; but in 1997 Stanley Prusiner received the Nobel Prize for discovering that those brain diseases were caused by mis-shaped proteins, prions, and not by a virus. For an entrée into the literature about mainstream opposition to novel views, try Ernest Hook (ed. ), Prematurity in Scientific Discovery: On Resistance and Neglect, University of California Press, 2002. In principle, then, any scientific consensus could be wrong. How are the media, the public, the policy makers to judge, whether or not a given consensus is to be believed? Believed firmly enough to base on it such policies as attempting to curb emission of carbon dioxide, at enormous cost and disruption of industries? Roger Pielke, in The Honest Broker (Cambridge University Press, 2007), suggests that the proper role for scientists is to lay out all sides of any given question and not to claim 100% certainty for any finding or theory. But that is far from the general practice. With global warming, for example, the policy makers and the media and the general public hear much about the scientific consensus and almost nothing about those who dissent from it — except that those dissenters are maligned as “denialists”, a conscious analogy to those who deny that the Holocaust happened, the Nazis’ deliberate extermination of Jews, Gypsies, homosexuals, physically handicapped people, and others as well. In absence of historical understanding, the fact of an existing consensus is said to establish its correctness. In the FRONTLINE documentary, “Climate of Doubt” (PBS TV, Tuesday 23 October 2012), the presenter (John Hockenberry) mentions several times that 97% of scientists accept that carbon dioxide significantly contributes to present warming — says it as though that discredits the skeptics whom he interviewed. There are two improper things about Hockenberry’s 97%. One is that it merely states that a consensus exists, when there is no guarantee that a consensus is necessarily correct. But it is also improper to assert dogmatically on a matter of science something that cannot possibly be based on known fact: Did Hockenberry ask all scientists before arriving at that “97%”? “I regard consensus science as an extremely pernicious development that ought to be stopped cold in its tracks. Historically, the claim of consensus has been the first refuge of scoundrels; it is a way to avoid debate by claiming that the matter is already settled. Whenever you hear the consensus of scientists agrees on something or other, reach for your wallet, because you’re being had” (“Aliens cause global warming”, Caltech Michelin Lecture, 17 January 2003; Google can find links to transcripts of the whole talk). How then might a lay person reach a reasonable opinion on a scientific matter like global warming where there is a sharp, politically determined polarization between a mainstream consensus and a dissenting minority? Only by looking at the evidence, of course. But could non-specialists make head or tail of the evidence? Isn’t it all too technical for a non-specialist? 1. Do any competent scientists disagree with the mainstream? If they do, then this might be one of the cases where the mainstream is wrong. Even 100% agreement doesn’t guarantee that the mainstream view is the last word, so history tells us; still less is 97% when the dissenting view is held by some of the most competent experts. In the case of global warming, there are thousands of dissenters; see for example the Leipzig Declaration and the websites of Fred Singer (www.sepp.org) and Roger Pielke Sr. (pielkeclimatesci.wordpress.com). For continuing coverage of news and controversy, try wattsupwiththat.com. 2. What evidence could support unequivocally the mainstream opinion? Note first that the crux of the mainstream view is a prediction more than a statement of observations already made. After all, even if there has been warming for some period of time, that does not entail that the warming will continue. Even if warming and carbon-dioxide levels have increased in tandem, that is only a correlation and not any proof of causation: correlations never prove causation. To assess the possible effect of carbon dioxide on future global warming, one would need to take into account everything that influences the heat balance of the Earth. Even cursory scanning of the literature reveals quickly that there are innumerable relevant factors. The rate at which the sun radiates energy to the Earth, for example. The greenhouse effect — trapping of energy by gases in the atmosphere — is brought about not only by carbon dioxide: water vapor is actually responsible for more of the greenhouse effect than is carbon dioxide, about 3 times as much, in fact; methane is responsible for about as much greenhouse action as is carbon dioxide, at present levels of both. Heat also comes to the Earth’s surface from below, illustrated by the lava or magma flows from volcanoes and deep-sea rifts. An excruciatingly detailed and documented enumeration of factors can be found in Ian Plimer’s Heaven and Earth: Global Warming, the Missing Science (Taylor Trade Publishing, 2009). 3. The upshot is that the possible effect of carbon dioxide on global warming cannot be calculated directly. Instead, a model is constructed of the Earth’s climate. But the model can be trustworthy only if it incorporates every pertinent factor. With so many factors involved, one can be reasonably sure that no model could be absolutely reliable. Even if all the influences were known, one would also need to understand exactly how they interact with one another. For example, the largest greenhouse effect is owing to water vapor, and the amount of that in the atmosphere varies with temperature (among other things). Cloud formation depends on the amount of water vapor as well as on other things (e.g. radiation and presence of material particles that act as seeds on which water vapor can accumulate); and clouds may add to or subtract from global warming depending on how high they are, as well as on other factors. 4. Most damaging to any mainstream modeling is the fact that the Earth’s climate has undergone many cycles of temperature, over ranges of temperature far larger than those currently being measured or calculated or speculated about. Over the Earth’s known history, average temperatures have cycled between about 10ºC and about 25ºC. 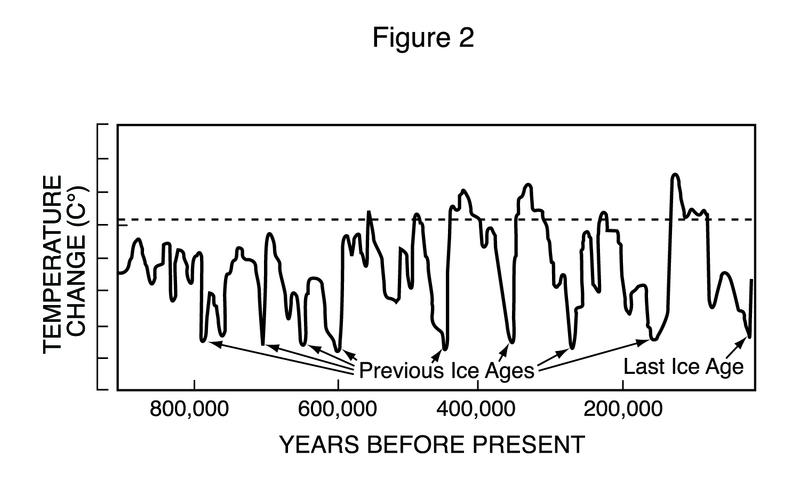 In the last million years, there have been 7 or 8 peaks and 7 or 8 valleys of temperature that differ by about 5ºC. The reason for those dramatic cycles is not known, or at least there is no agreement over what brought them about. Therefore no model of climate can be reliable, since it cannot account for these drastic historical variations in temperature. 5. Finally: The last valley of temperature, the last Ice Age, came to an end only about 15,000 years ago. The historical cycles indicate that the Earth will now warm by about 5ºC over the next hundred thousand years or so owing to the influence of those unknown factors. It is impossible to stop that since we don’t understand why these cycles happen. These points are surely accessible to anyone, and they demonstrate that one cannot truthfully claim that it is settled science, that human-caused emission of carbon dioxide is appreciably contributing to global warming. There is no reason why conservatives should find these points more convincing than liberals do. As my title suggests, it is perfectly reasonable to be politically liberal and also skeptical about human-caused global warming. Indeed, I offer myself as an example. Why have these points failed to penetrate public discourse? I suggest the chief underlying reason is the failure to understand that mainstream science can be wrong. Such an understanding is an essential component of being literate about science. Scientific literacy ought to be defined — but presently is not — as literacy about the history of science and the nature of scientific activity and scientific institutions, not just literacy about bits of science like molecules or gravity.